“I would like to express my deepest appreciation for what you do. You give one of the best gifts in our kids’ lives! To be able to speak in front of many people with confidence, pride, strong leadership, and a positive attitude. 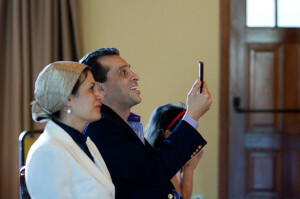 What an inspiration you give to our children – to be able to express their thoughts and feelings without any fear. I would like to thank the Academy for that! 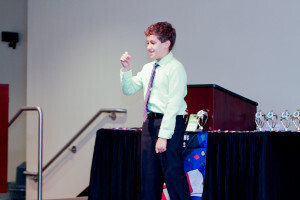 My son, who was 11 years old, did not care about public speaking as most of the kids his age. After his first class, his eyes lit up and he said to me, “Mommy, I love it!” There is nothing else I can add to that statement. “You should take this class because it makes you more confident about talking in public.” Sophia, Two Time Graduate of the Level One Course! 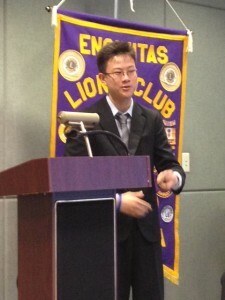 Austin Zhang, 1st Place Winner! 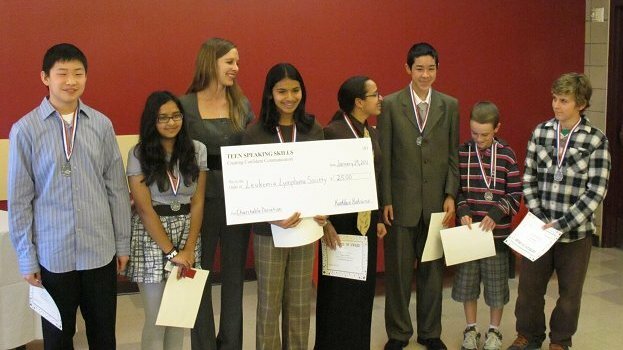 “Taking this Teen Toastmasters course was a new experience for my teenagers Rachel & Vincent. From overheard conversations between themselves, Rachel & Vincent have at the very least, been made more aware of the unnamed ums and likes sprinkled throughout their speeches. 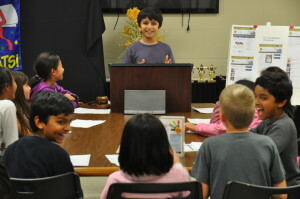 Preparing for their respective speeches also forced them to be more organized with their thoughts and presentation. From watching their peers present their speeches, Rachel & Vincent have learned the manner in which one delivers his speech can affect his image and self-confidence in front of an audience. Since all teens will become adults and must work one day, they might as well take advantage of this great opportunity to polish up on public speaking skills, and maybe one day impress their potential employers. Academy for Public Speaking Fall 2013 Graduates Celebrating with President Kathleen Petrone! Kathleen Petrone is very committed and dedicated to these kids. She pours her heart and soul into the course. Kathleen really helps make each student attain their full potential. Next, she makes herself available. She offers her time and encouragement to her students. 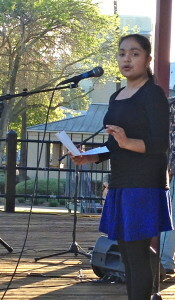 For example, my daughter, after completing the course, was in a speech contest–Kathleen was willing to go over her speech with her and give her pointers. This was on her own free time! Third, Kathleen arranges for Toastmasters guest speakers and really works to improve her courses with each session. She asks for feedback and incorporates it into future courses. Last, but not least–the graduation. Kathleen goes all out in making the students feel honored and special. 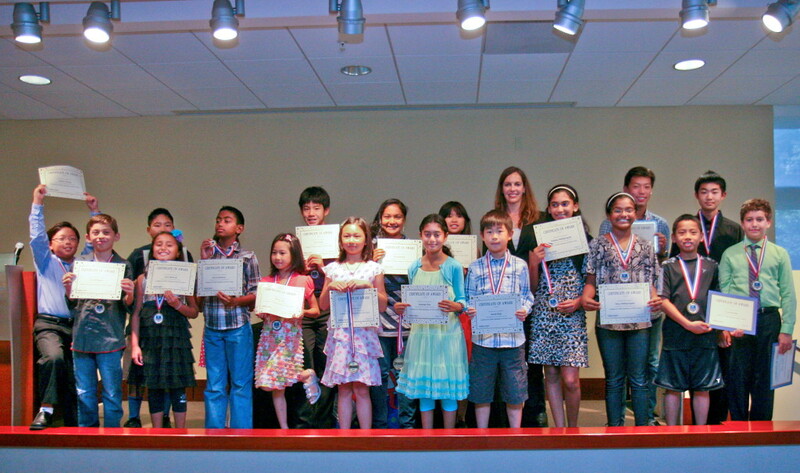 The kids get beautiful certificates, engraved medals, and a chance to display their speeches to their parents. Plus–the winner of the speech contest wins a donation to the charity of their choice! What a great idea!